Swamp White Oak - Quercus bicolor. Although it thrives in wet soil, it also tolerates drought and prefers full sun exposure. 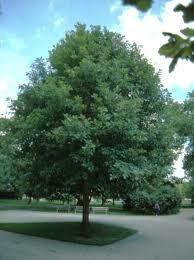 This medium-sized deciduous tree makes a magnificent shade tree for large areas. It reaches a height of 40 feet in 50 years. The leaves on this tree are dark green on top and silvery-white on the bottom and change to copper or red in the fall. Its dark brown bark is flaky and deeply furrowed. The Swamp White Oak begins to bear acorns 20 to 30 years after it is planted. 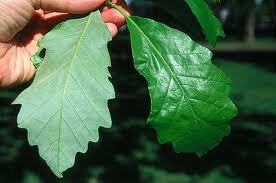 The Swamp White Oak is native to the riverbanks and bottomland of the eastern United States. Although it thrives in wet soil, it also tolerates drought and prefers full sun exposure. 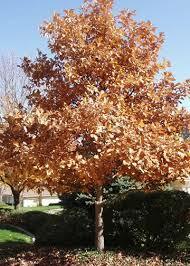 This medium-sized deciduous tree makes a magnificent shade tree for large areas. It reaches a height of 40 feet in 50 years. The leaves on this tree are dark green on top and silvery-white on the bottom and change to copper or red in the fall. Its dark brown bark is flaky and deeply furrowed. The Swamp White Oak begins to bear acorns 20 to 30 years after it is planted. Swamp White Oak tree’s branches expand to about 15 feet wide. It has a solid trunk with great bark. When looking to make this tree as part of your landscaping, it will be in your best interest to plant it in either a field or a yard that is at least 100 square feet. This way it will have plenty of space to grow and stand out. It is native to North America's Midwest and Northeast. Though small, it can often live to be 300 years old or more! The acorns of this oak often help to attract wildlife like deer and turkey to your area. They mature to very large and are great for providing shade to a lawn. These are one of the smallest growing oak trees but can still grow to be very tall. They are great and are very easy for homeowners to grow as they take no special care to maintain. They also bring lots of color with their beautiful leaves that change colors with the seasons. They are also loved by squirrels and also a variety of birds that enjoy the acorns they produce.